Koala Wooden Pencil is a lovely pencil with a crazy looking koala on the top. This grey wooden pencil has black stripes and the koala has lovely felt ears. The attention to detail on the face is fantastic and for a koala it looks remarkably awake. 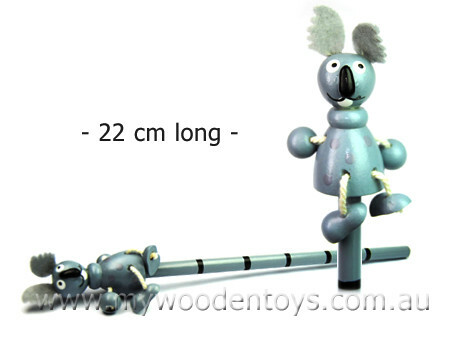 The koala has feet and hands attached via cotton string, so the wobble about. This is a very pretty little stationery toy and a lovely addition to your little ones pencil case. Material: Wood, Felt, Cotton String. We like this because: "Very nicely painted."